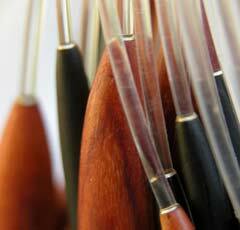 The company HOLZ & STEIN was the first vendor of needles made of rosewood, ebony and kingwood in 1982. Up until then, most knitting needles were made of metal and bamboo. If one could get any wooden needles they were made of beech. In contrast to instrumental wood, beech wood is very fibrous, raw, and soft, splinters easily, and makes it difficult to slip stitches off the needle. Bamboo needles are often mistakenly taken for wooden needles. But bamboo is a very cheap and fast-growing grass. In fact bamboo needles do not hold up very well. Especially the points of the needles are not very durable and fray easily. Metal is characterized by the disadvantage that it is conductive; and the loud clattering of metal needles can be bothersome. Plastic needles were widespread in the 50's and 60's but many knitters found them unpleasant to knit with, often resulting in sweaty hands. Even less common are needles made of casein, bone and horn. When ordering HOLZ & STEIN needles you will get a remarkably noble and high-quality natural product made of rosewood, ebony and kingwood. The advantages of these needles are obvious. Wood does not conduct temperature so the hands neither become cold nor sweaty. It is electrostatically neutral-an advantage for people suffering from painful rheumatism or neuralgia or from heart or circulation problems. Many knitters have reported that since using our wooden needles they no longer experience the negative effects that can be caused by needles made of traditional materials.Due to their hardness the needles can be honed to feel very smooth. The needles also do not splinter and overall are very durable. By request we offer spare needles and a repair service. As long as technically possible, we are also happy to accommodate requests for custom-made needles.Knitting needles made of instrument wood are admittedly more expensive but when taking into account that the price for instrument-quality wood is 20 times higher than the price of beech wood (not to mention bamboo) and that the manufacture is extremely complex and difficult, the price is low even when compared to that of other needles. Moreover the exceptional quality of the final product has to be considered. Only HOLZ & STEIN offers a specially developed brass adapter, which is built into the circular needles. It has been patented and ensures the virtually seamless connection between the flexible plastic string and wood and thus facilitates the smooth sliding of the stitches. It also prevents breaking of the wood when the yarn is pulled strongly.